I am SO excited about this giveaway! 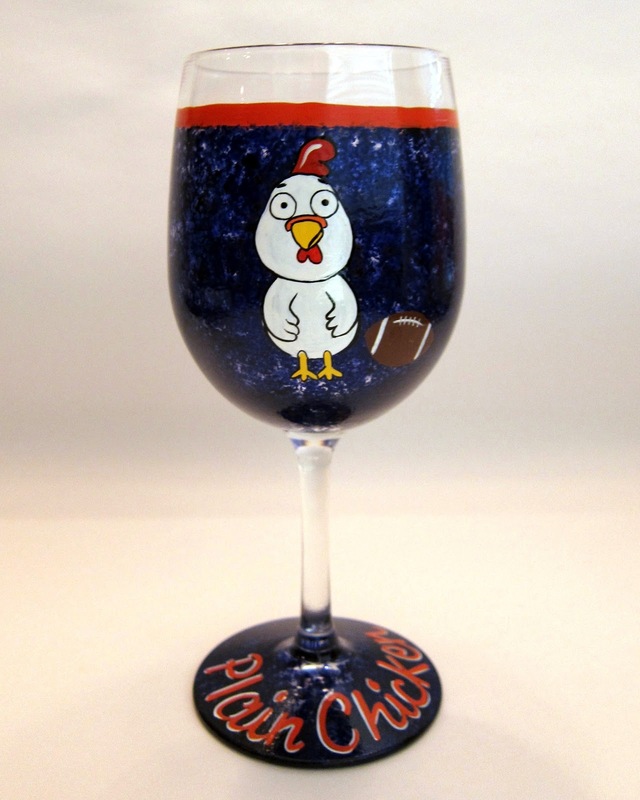 The incredibly talented Renee, from Kudos Kitchen by Renee, is offering one Plain Chicken reader a chance to win two custom painted glasses. I've been friends with Renee on twitter for a long time. She started out making custom decorated cookies and then switched to custom painted tiles. When she offered custom painted wine glasses I immediately placed an order for a Plain Chicken glass. I have ordered several more glasses since my initial order. I have an Auburn glass for football season. 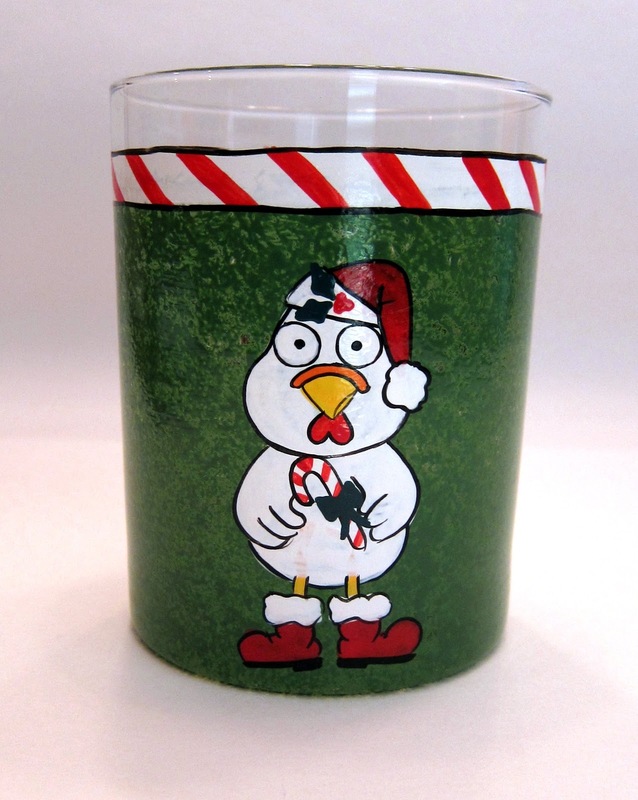 Even Chicken Legs has a Plain Chicken glass for his Maker's 46 and Diet Coke. Ordering is so easy. I just tell Renee that I want and let her work her creative magic. The glasses are always better than I could have ever imagined! I can't wait to add to my collection next year. 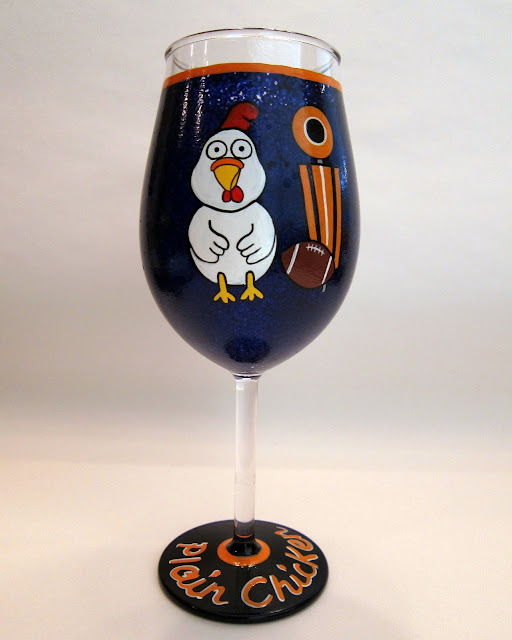 Renee is offering two custom painted glasses of your choice. She paints more than wine glasses. She has double old fashioned glasses, pint glasses, champagne flutes, margarita glasses - everything. Head over to Renee's Etsy shop and check out her glasses. Leave a comment, on this post, with what you would have Renee create for you. BONUS ENTRY! "Like" Kudos Kitchen for Renee on Facebook and leave a comment, on this post, that you "Liked" her page. The giveaway is open until Friday, November 23, 2012 at 11:59 CST. The giveaway is only open to USA residents. Be sure a valid email address is included with your comment(s). Winner will be chosen randomly. We will email the winner and if the winner doesn’t respond in 48 hours, a new winner will be chosen. Good luck! I would love to get one done for my best friend with something "bon jovi"--would be a great christmas gift. And i "liked " the facebook page ! i would like a set of monogrammed champagne glasses - we did not register for champagne glasses for our wedding and now i always wish we had some! Those are great wineglasses (among other things)! I think I would have to think something ocean inspired or something for my Denver Broncos. I love her Disney themed ones they are amazing....but if I won I would like a coffee mug personalized for my hubby with his name on it. Love those glasses! 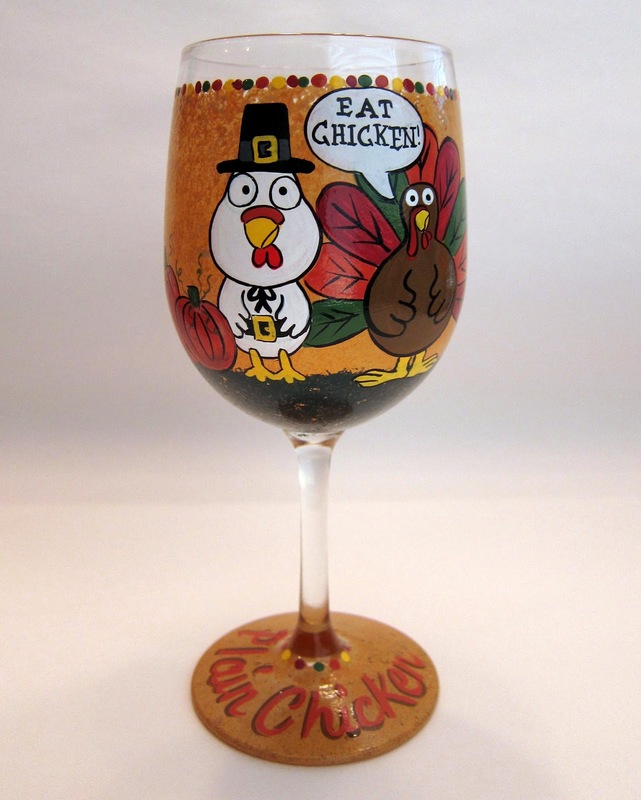 I would either get something UK inspired or one of the adorable Christmas wine glasses. Would love a wine glass for my best friend for Christmas! it looks like she can make anything on them. I would love A Christmas wine glass with the leg lamp from a Christmas story on it and to personalize it with Merry Christmas RaRa :) Thank you. I would have her do a glass for each one of my little girls with their names on it. I love her pumpkin bowls by the way!! I would like a dog painted on it or one of the KEEP CALM sayings. I liked her facebook page as well. I think her Wonder Woman glasses are really neat! I really liked Sam the Snowman. they're all SO cute!!! I would probably get either a bunko glass or the winking Santa. It would be a tough choice! Liked fb page! These are great! I would love to have some painted coffee mugs. My husband and I are so homesick for our home state of Wisconsin (we're living in Maryland) and would LOVE tumblers with a Packers logo for our brandy old-fashionds! What a talented person. Loved her City Silouhette Painted Martini Glasses the most. I liked her on FB too. Thanks, Donnie W.
The Harry Potter glasses! They are so cute! I love the cheetah print wine glass! So sassy! I'm an Alabama girl living in DC and missing the south terribly. :( Sad face for cold winters, too much traffic and city rat race. I'm pretty sure she could make some awesome Bama highball glasses for our bourbon drinks. OMGosh your Plain Chicken glasses are Awesome! !I want to call your chicken Harvey?? LOL. I went & checked out her Etsy shop. Everything in there is fabulous!!! My favorite was the Hello Kitty wine glass & the Olive Oly oil dispenser!! Too fun!! I have seen these on your Instagram a few times and always assumed You got them locally...so excited I am going to have to order some!!! I am a South Carolina girl so I think Id need to represent my Palmetto State with the state tree! Great glasses. I'd probably want to get something Christmas related or something about my favorite hobby, knitting. I love these...I would get a pair of Gator ones similar to your Auburn ones....love the and great idea. I like the Custom Animal Print Monogram Tumbler. I would love either a Wonder Woman or Pittsburgh Steelers glass...both were awesome! Love all of the glasses! I would like either an Indianapolis Colts or a Pomeranian one after my pup. I checked out Renee's shop. So many goodies to choose from. Here's what I think would be great: An acrylic (much clumsiness here) Pilsner with some version of "Eat. Sleep. Read" on it in white letters on a red background. I "liked" Kudos Kitchen By Renee. Such a neat, unique idea! If I won, I'd request a custom order-- just a basic monogram put on my glass. Thanks for the opportunity! I would love a custom MSU glass or maybe one that looks like our dachshund - you know to go completely around the glass. 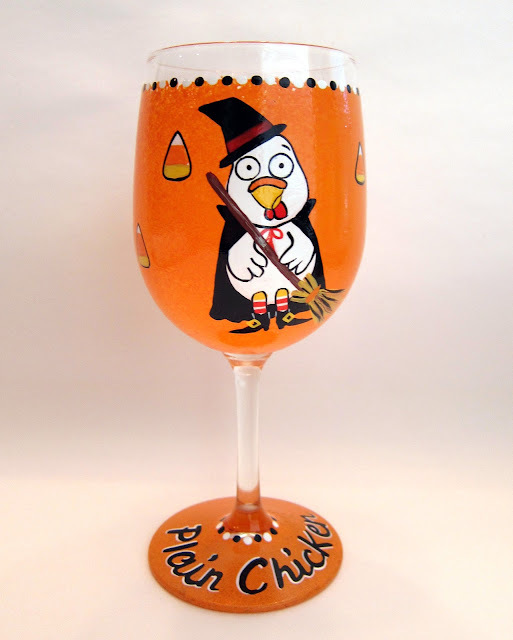 =) Love your Plain Chicken glasses! All of them are so creative! I would like to have Auburn and Alabama glasses. I also "liked" her FB page. I liked Kudos Kitchen on Facebook! I would have some made with veggies, herbs and or hot peppers. I "Like" Kudos Kitchen for Renee on Facebook. I'd love coffee mugs with Winter Birch Trees painted on them, So pretty! I would ask for Virginia Tech Hokie Bird pint glasses. I wonder if they are available in acrylic for throwing - it's been a very rough season, still hoping we can be bowl eligible. Also liked her on Facebook. I would LOVE. Memphis Tigers glass and a Memphis Grizzlies glass. I also liked her Facebook page! A popcorn wine glass! Those are my two favorite things! It was like it was made just for me. Would love to have a set of UA custome glasses for my daughter and soninlaw. Also liked her page-Her stuff is so neat! Pacman and Mrs. Pacman for the husband and me! I would choose a set of monogrammed wine glasses or Eagles themed beer mugs for my boyfriend. I would like the pink poodle hot chocolate mug! I loved so many..The Santa and Elf glasses the Popcorn the stand Mixer the sock monkey! I "liked" her page on facebook too! Those custom Plain Chicken glasses look great! If I could win 2 glasses I would chose 2 custom painted everyday glasses- they would be awesome I'm sure!! I would do either the polka dot initialed glass or the Tiffany box inspired glass! So cute! I like the grinch ones! I would probably have to have an OU football wineglass but in acrylic because of the stress they put me through in watching their games. Also liked Renee on facebook. I would love to have the Dog Breed Treat Jar....so cute!!! I would have Purdue glasses made for my best friend! I would love to get a fleur de lis/LSU one done! I liked the other page as well! I would love to get some of these glasses for my sister for Christmas. She was just asking for some special wine glasses. She is a baker, like me, with her specialty being cupcakes. I would definitely want some painted with cupcakes. I love the Pink Paris Poodle, pink is my favorite color. I absolutely LOVE these glasses! I started collecting wine glasses after my husband and I found out how much we enjoy visiting wi dries around the country. This site has given me a new place to send my husband and 13 kids to find new glasses to add to our collection. 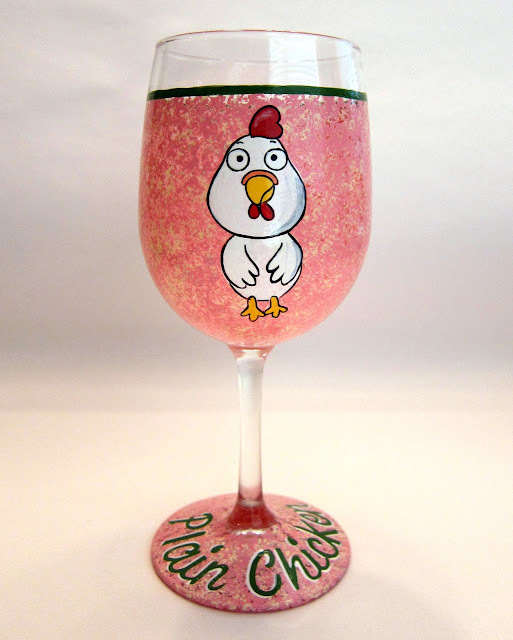 I would for sure order some chicken glasses and also have a few designed with a Fleur De Lis design . Thanks for directing us to her site. I liked it on Facebook as well. How awesome! Renee does beautiful work. I love the Santa and Elf and the Modern Polka Dot with Initial. I would love to have glasses with Memphis Tigers (football), though! I'm loving the Hello Kitty Painted Wine Glass...I'd give it to my sister, who loves all things "Hello Kitty". If I had to choose something for myself...it would be the Sock Monkey Painted Hot Chocolate Mug. Love all the glasses. I would like to have some everyday glasses done in a TCU Horned Frogs theme. I also "liked" the facebook page! I would love a set of NY Yankees glasses. She is so talented! I love everything she has done. Thanks for the chance! I also liked Kudos Kitchen by Renee on FB. Oh gosh I love them ALL. I would probably have to have a set all about the Alabama Crimson Tide :) Or coffee-related for my husband! I "liked" Kudos Kitchen on Facebook! I would get a WV glass! OH I love the farmhouse one, she is very very talented. I would love a cabin in the snow surrounded by evergreen trees. I love all of her stuff! How cute! I'd probably request something with tropical flowers on it to remind me of my wedding in St. Lucia :) Or maybe with a fleur di lis since I live on the Gulf Coast! They are all so cute, but I think I'd go with some painted coffee mugs. Those would get used every day! Really cure. I would want one with a New Orleans theme something with a fleur de lis maybe. I also "liked" her on Facebook. Such talent ! Love the grinch but may have to have one made for a wedding coming up in the spring. 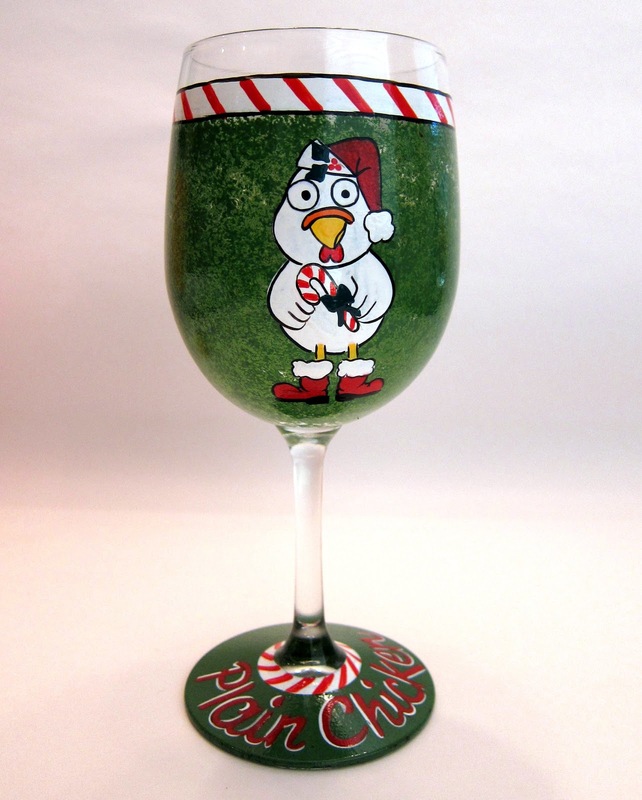 I would love the holiday wine glasses! I would like a sunflower themed glass for myself and one with the SELU lion for my son! In spite of the year we have had, I would still want the War Eagle ones. With Iron Bowl coming up, I'd love Alabama football themed high ball glasses! Roll Tide! I've also "liked" on FB! I forgot my email address, sorry. My daughter and I always have a "Christmas Bake Day". We bake, laugh, listen to Christmas music and drink wine. Just enjoy our time together, so I'd get the Christmas baking glasses to give her this year. Forgot to say that I have liked Renee's FB page. All of Renee's glasses are beautiful but a set of Auburn glasses would be great or a set of "Pink Ribbon" glasses but done with a Yellow Ribbon in support of my daughter's battle with Sarcoma. I would love the "everyday glasses" in blue and white for my Kentucky Wildcats! I liked her Facebook page too! I like the spider man cup for my little guy. Adorable personalized wine glasses !! What amazing glasses! I am pretty sure I won't win, but I am all for trying! Plain Chicken literally taught me to cook in 2012, so I would want LSU themed Plain Chicken glasses to use while I cook!!! I would have Renee make me a giant coffee mug that has yarn and some goofy sheep and it would say "Keep on Knitting" I also liked Renee's facebook page.